Published March 26, 2010 at 500 × 350 in Art. This piece was created using mostly oil pastels and a little bit of acrylic paint. The large bald eagle is representative of Father God how He is in control and seeing everything going on in the world. He is big enough to cover us all with His wings. 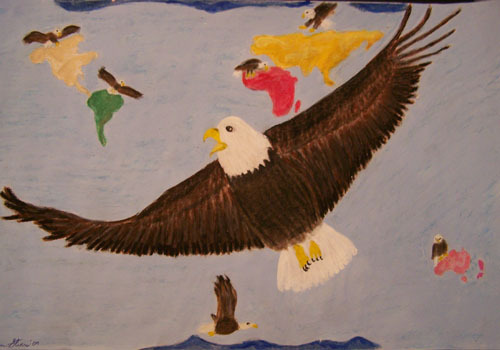 The smaller bald eagles represent the Holy Spirit and how He is moving throughout the earth. But he moves in different ways, which is represented by the different positions that each eagle is in on each continent.